Escape to your own Blue Mountains piece of paradise. 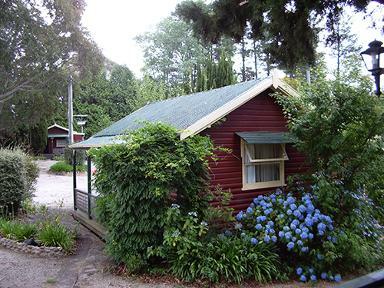 Cedar Lodge Cabins are set high in the village of Mount Victoria and, being centrally located to all the major attractions, are the perfect place to base your mountain adventure. Nestled in a beautiful bushland garden, you can visit the Jenolan Caves (55km), the Three Sisters (20km), Scenic Railway (20km), Mt Tomah Botanical Gardens (30km), or the Zig-Zag Railway (17km), go bushwalking, abseiling, horse riding, or, for the less energetic, explore the local history and scenic picnic spots, stroll through the village galleries and shops or sample the cuisine in the local cafés and restaurants, or just relax in one of our individual air-conditioned cabins. We have a site on Flickr, the Yahoo photo-sharing site, where we have posted some photos of the local area and some historical photos from the family postcard album. Why not enjoy a soothing relaxation massage during your stay with us?